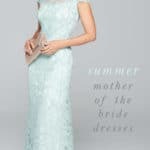 You are here: Home / Wedding Attire / The Gal Meets Glam Collection Has Pretty Dresses for Weddings! The Gal Meets Glam Collection Has Pretty Dresses for Weddings! The new Gal Meets Glam collection from Julia Engel, brings us beautiful and classic dresses, with a distinctly feminine flair. 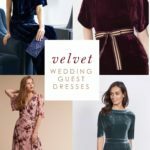 These charming dress styles from the Gal Meets Glam Collection are perfect for weddings and all sorts of wedding related events! We’ll share a few of our favorites! Jennifer Shimmer Wrap Dress is a perfect classic and elegant look for a daytime or afternoon wedding. We love the long sleeves, wrap styling and flounce hem. Comes in green and mauve. 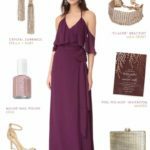 We have been long time followers and fans of the woman behind the blog Gal Meets Glam, Julia Engel, and so we were delighted when she released her collection of dresses earlier this spring. Each month new Gal Meets Glam collection dresses have been released, and they couldn’t be prettier! With this collection, Engel brings her signature polished and pretty style to the rest of us. 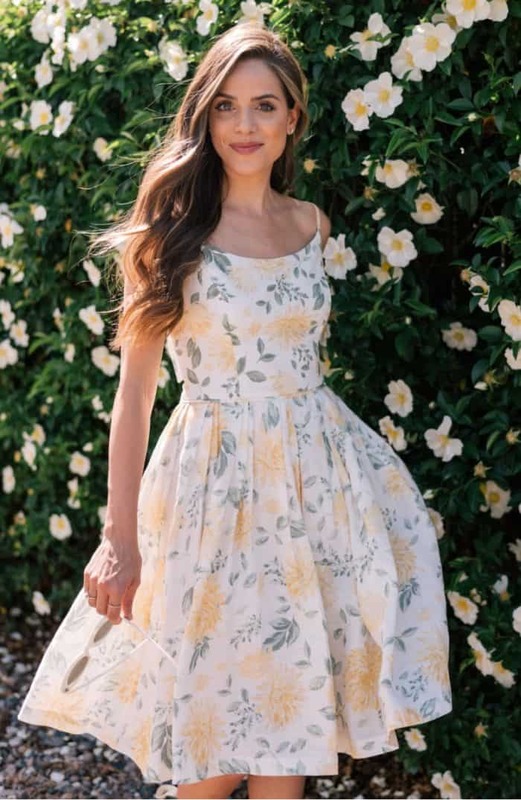 The Abigail Sundress is a beautiful choice for bridal shower, rehearsal dinner, engagement photos, or just for summer day dressing! 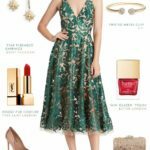 Gal Meets Glam Dresses for Weddings! 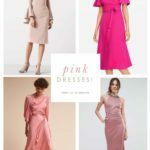 The collection ranges from beautiful day dresses which would be lovely for bridal showers, bridesmaid brunches, or to pack for a honeymoon, to special occasion dresses that will suit guests who are facing a season full of weddings. Here, we highlight a few of our favorite looks. 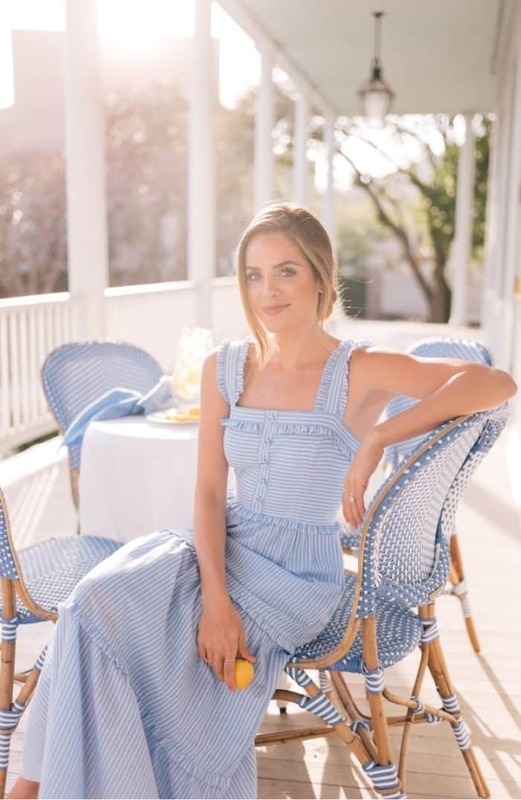 Pack this classic blue and white striped maxi dress for your honeymoon, or wear it to a bridal shower. It’s the Courtney Rio Dress. For an outdoor summer wedding, or beachside party, try this blue floral maxi dress. It’s the Ella Floral Ruffle Maxi Dress. 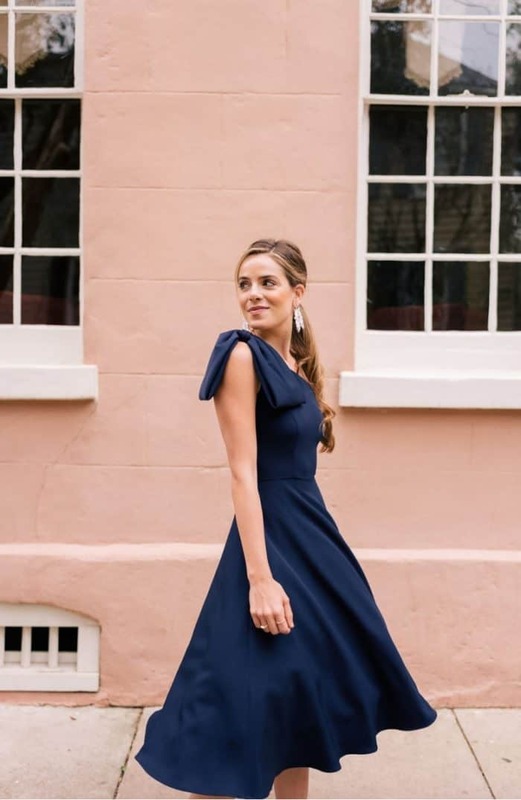 Wedding guests can never go wrong with a classic navy dress. The one shoulder styling and bow, makes this one special! Yvonne Dress in Navy Crepe. 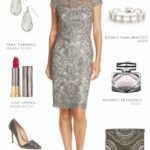 Perfect for a wedding guest, or for a bride to be to wear to an engagement party, or rehearsal dinner. This blush pink lace midi dress is dotted with beautiful embroidered floral buds. It’s the Penelope Dress. This super cute white dress features oversized statement sleeves and a sweet scalloped hem. Perfect little white dress for brides-to-be to wear to wedding events! The Blythe Scallop Eyelet dress. A classic and flattering off the shoulder style, with gathered bow at the neckline, and a flounce hem. A great choice for evening weddings. This is the Tyler dress and it’s on sale! One of the first dresses we fell in love from the Gal Meets Glam line. This is the quintessential summer wedding guest look. This is the Yvonne Dress and it’s on sale in this color! Another perfect look for brides-to-be is this pearl-trimmed little white dress. 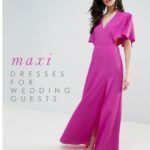 A classic choice for a getaway dress, your engagement photos, or for any of the pre-wedding parties you may be a part of! The Victoria Pearly Trim Dress. You can find the collection at Nordstrom, or from the Gal Meets Glam site. As always, Julia Engel has styled these dresses perfectly! 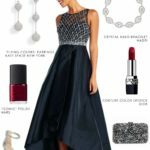 Images via Nordstrom, and Gal Meets Glam.